Kelly Daigle studies nutrition science at Simmons University and will be continuing her studies at Simmons to complete a masters and the dietetic internship. She grew up in Rockport, MA and currently lives in East Boston. As a nutrition student at Simmons University, I have been working with the members of Boys & Girls Clubs of Boston’s (BGCB) Charlestown Club for the spring 2019 semester. My goal for the semester is to provide nutrition and healthy eating education to the members with the hope that these lessons will reinforce the healthy behaviors that the BGCB encourages and encourage them to put these into practice in their lives every day. One of the biggest lessons I have learned while working with members so far is finding ways to present education that is fun and engaging while at the same time sending the desired message. When first meeting members, I learned quickly being creative and hands-on is important to everyone at BGCC. This led me to decide to focus my lesson on the importance of “Eating a Rainbow of Fruits and Vegetables” around an art project. 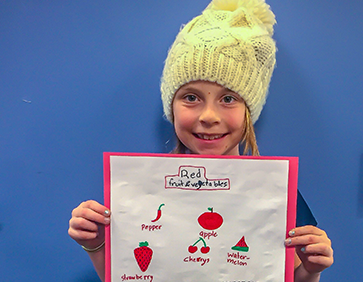 I also created a fun, fill-in-the-blank worksheet to present the lesson that allowed the members to participate in learning important facts about healthy eating. I was surprised at how much the members enjoyed talking about food, especially that they were interested in learning about the benefits of eating a variety of vitamins and minerals found in colorful fruits and veggies. I assigned each member a color of the rainbow and asked them to create a colorful drawing of fruits and vegetables of their color. I brought printouts of foods to encourage them to think outside of the box about foods that exist of each color. For instance, for red I wanted them to choose things other than apples, so I showed them pictures of red peppers, cherries, and radishes. For orange, oranges and carrots jump to mind, but I also introduced squash, sweet potatoes, and pumpkins, and for green showed them Brussels sprouts, avocado, and asparagus. I was hoping to make unfamiliar foods a little more approachable by comparing them to foods they already knew well. The members were so engaged in creating their artwork, which we will hang on display in the BGCB cafeteria as a reminder of their talent and what they learned. Since creativity and being hands-on was so well received, I decided to continue with that in my next lesson. Some of the members had asked if they could bring their worksheets home with them (I was so impressed! ), which sparked me to think that creating a fun magnet with some nutritional info would be a fun project. I presented them the idea that eating colorful foods full of vitamins and minerals can help give their body “superpowers” like the ability to build muscle and bone, protect against sickness, fight off germs, and improve their memory. We created our magnets around these superpowers, and each member was able to take his or her magnet home to hang on the fridge to remind them why they should choose these nutritious foods. For our next lesson, I am developing fun recipes and offering a tasting demo using the BGCB produce of the month, peas. I can’t wait to surprise the members with delicious flavors and new preparations of food they are familiar with. It has been rewarding for me to watch the kids engage with nutrition education and accept it so openly. It is encouraging to hear them talk about their favorite fruits and vegetables. I even heard members telling their friends ways they like to eat certain foods like, “I love Brussel sprouts cooked with bacon,” or “Salad is so good with avocados in it!” I am encouraged that they are already learning how important what they eat now is to how they grow and also for the adult that they will become. I am appreciative that the members and faculty at BGCB are so receptive to new people like me and to learning new ideas. Thanks to partners like Harvard Pilgrim Health Care Foundation for supporting Boys & Girls Clubs of Boston’s healthy development programming and education.